Field Guide To ParentingOur A.V. 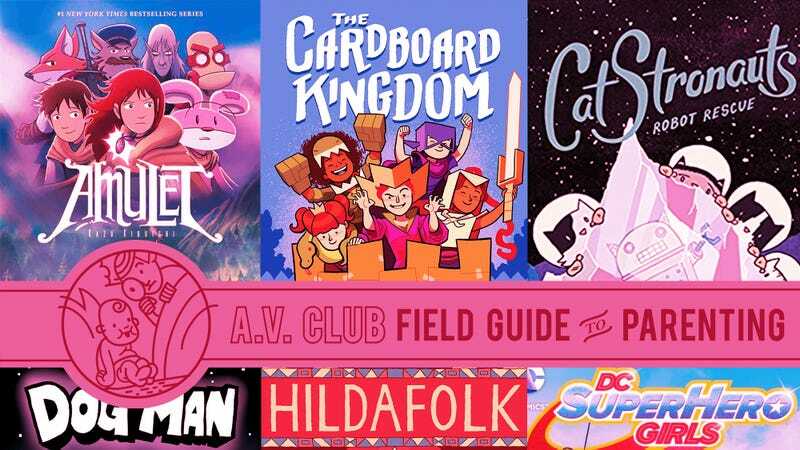 Club Field Guide To Parenting is designed to guide you toward the best kids’ books, shows, movies, and music, just like we do with The A.V. Club for adults. Every month or so, we will feature a new subject with a few essential pop culture takes. Our daughter’s turning 14 this summer, and in recent years her interest in reading comics has waned somewhat, for three very good reasons: 1) She’s busy making art of her own; 2) she’s become deeply engaged with social issues; and 3) she spends a lot of her spare time either hanging out with or texting friends. Still, when my wife bought her a copy of The Cardboard Kingdom earlier this year, she started flipping through it right away, and raced through the whole book in under an hour—coming out of her room periodically to tell us about her favorite characters. Set over the course of one summer in a racially and ethnically diverse suburban neighborhood, The Cardboard Kingdom is a collection of short stories (each about eight to 10 pages) following a group of kids who turn discarded boxes into costumes, weapons, and scenery for an epic game of make-believe. Artist Chad Sell works with different writers, who each focus on small groups of the kids, contrasting their complicated home lives with the cathartic release of their fantasies—where a boy can be the princess if he wants, or a girl can be loud and strong. The messages here are simple, and what my daughter would approvingly call “verrrry soft.” Listen to what your imagination is telling you about who you really are, and be welcoming to others who are doing the same. DC Superhero Girls is available in a variety of formats—if your kids love the comics, they can watch the show on TV, and even follow up with a chapter book series. And frankly, it’ll be hard for this sunny series not to win them over, as familiar faces like Wonder Woman, Supergirl, Batgirl, Katana, and Bumble Bee grapple with detention, friends, and finals as well as their superpowers in high school. Even traditional villains like Poison Ivy and Harley Quinn get a chance to be featured, and you can spot other familiar DC characters throughout (like Steve Trevor working at a smoothie shop). Seeing adolescent superheroes with foibles—like when Supergirl forgets her stealth suit before class—might make your kids feel better about their own shortcomings: Even Wonder Woman isn’t perfect. Dav Pilkey is best known for the mega-selling Captain Underpants series, which is a little above my 5-year-old’s head. That’s not the case with Dog Man, a spinoff of sorts about a half-dog, half-man police officer. The story goes that Captain Underpants’ Harold and George created Dog Man when they first met each other in kindergarten. But then they created the Captain Underpants comic, which turned real and took all of their attention. They’ve since returned to write and draw new Dog Man comics, which explains the childlike artwork and writing. Because Pilkey writes and illustrates it from the perspective of two kids, Dog Man is winningly juvenile, full of loopy adventures and goofy characters. My little girl loves being silly, which makes Dog Man the perfect reading material for her. Lord knows there’s a lot of fantasy stuff for your kid to get into eventually, from the Harry Potter series to any hobbit version they choose. Kazu Kibuishi’s Amulet, though, offers an ambitious and beautifully depicted fantasy universe, in which young Emily inherits a special stone in an amulet from her great-grandfather, which leads her, her brother, and her mom into a world of elves and sorcery, and even into space. There’s a lot going on, which makes it worthwhile for at least a few re-reads (the amulet makes Emily a stone keeper, as she fights shadowy and evil forces alongside a fox assassin, her family, four robots, an elf prince, and two piloting man-cats). My son, who was pretty chapter-book-adverse, put the latest Amulet release on his Christmas list. Borrowing a few volumes myself, I could easily see why. Young Emily is a fierce, ideal hero for kids, as she’s trying to wield great power while simultaneously not letting it take her over completely (a nice metaphor for adolescence itself). The series is about to wrap up with volume nine, but there’s lots of valuable backstory in the previous eight volumes. Luke Pearson’s Hildafolk series is like if Roald Dahl piled a bunch of stories on top of each other and delivered it in a whimsical folk-art style. Our engaging hero, Hilda, has no problem communicating with creatures as outlandish as ancient giants, mountain trolls, and tiny civilizations living right outside her doorstep. Her ability to accept every magical plot twist with aplomb makes her a fun hero for kids to watch in an unfamiliar, vaguely Nordic land, as she moves from living out by the frozen fjords to the city of Trolberg. Unsurprisingly, Hilda’s own Netflix series kicks off this fall, but you can easily get your kids started on her several available volumes before then. Drew Brockington’s enormously charming CatStronauts series—the fourth book, Robot Rescue, arrived in late April—follows the adventures of a group of feline space explorers working for a NASA stand-in called CATSUP (Center For Aeronautical Technology And Space Underlying Programs). The five main characters—crew leader Major Meowser, perpetually hungry pilot Waffles, chief science officer Pom Pom, technical specialist Blanket, and robot Cat-Stro-Bot—provide the core, with some secondary characters frequently stealing their scenes, like World’s Best Scientist (the daffy brains behind CATSUP) and the U.S. president (who’s constantly anxious about his re-election). Brockington writes and illustrates the series, which looks fantastic—he nails the balance of cute and cartoonish, and grounded—and is a breezy, fun read. The books are funny but not overly jokey, and they have a surprising amount of heart. Robot Rescue, for instance, follows the team to Jupiter’s moon Europa to rescue Cat-Stro-Bot and has an unexpectedly moving climax. The playful tone works for young readers—my daughter is 5 and immediately became obsessed with it—yet CatStronauts should still appeal to kids twice that age. Brockington’s fifth book in the series, Slapdash Science, arrives in August of 2019. Raina Telgemeier offers a multitude of warm, wonderful graphic novels for the middle schooler, from her interpretation of The Baby-Sitters Club to communicating with the dearly departed in Ghosts. I’ve read her books almost as much as my daughter has. But the one I would most highly recommend for the coming-of-age tween is Smile. Here Telgemeier describes her horrific accident in sixth grade in which she knocked out her two front teeth and needed extensive surgery and braces. The rigor of the year is underlined by a crush on a boy and her surprisingly unsympathetic circle of friends. Smile would make for a worthwhile read just for giving kids a preview of their possible eventual orthodontia, and her explicitly detailed dental visits may bring back long-forgotten memories for those of us who had braces. But as mean-girl tendencies start to emerge in middle school, Smile also offers a valuable lesson for kids on how to ascertain who your real friends are, and how to stay true to yourself in the meantime. I’ve written a few times for The A.V. Club over the years about how I sneakily got my daughter to love comics when she was a grade-schooler: by casually putting some of my favorites onto her bookshelf and then letting her “discover” them herself. I wasn’t surprised she became a Little Lulu and Calvin And Hobbes fan via this little experiment, but I was delighted when she also embraced Harold Gray’s Depression-era newspaper comic Little Orphan Annie. One of the most reliable page-turners from the heyday of the daily adventure strips, Annie is more than just fodder for that melodramatic musical about a plucky little kid who befriends a cranky millionaire. From the mid-1920s onward, Annie traveled the world, often cut off from her benefactor Daddy Warbucks, having to rely on her wits and affability to confound criminals and work her way back home. Gray told stories that lasted months, using their twists and turns to hook readers while he slipped in some not-so-subtle pro-capitalist propaganda. IDW’s pricey-but-handsome hardcover series (now up to volume 14) offers plenty of “keep reading long past bedtime to see what happens next” entertainment, and some fascinating American history lessons to boot.